The room 90 of the Uffizi Gallery is dedicated to Michelangelo Merisi da Caravaggio (1571-1610). Caravaggio is one of the greatest artists in the history of Italian art, a painter who does not need any introduction. Many historians consider him the founder of modern art. At the Uffizi three works by Caravaggio are exhibited. The Bacchus and the Medusa date back to his early period. They were painted around 1597. Bacchus is the god of wine. In the painting he is represented with some of the typical elements of his iconography: the crown of vine or ivy leaves, the cup of wine. The work is known for the extraordinary realism with which some details are represented, such as the transparency of the cup of wine. The Medusa is an oil painting on canvas, mounted on a wooden shield. It is a ceremonial shield, typical of the sixteenth century. 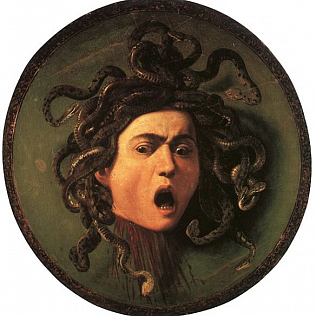 Caravaggio painted the Medusa\'s head severed from the body, by Perseus. The realism is observable in the spray of blood and in the representation of serpents, which form the hair of Medusa. The most poignant element is undoubtedly the expression of Medusa, represented while she is screaming. The work is considered an example of Caravaggio\'s great qualities, able to cancel, in his painting, the effect of convexity of the shield. The Sacrifice of Isaac dates back to 1603. The work represents the moment when the angel stops Abraham\'s arm. Isaac\'s face expresses how dramatic is this episode. In this work, the violence of the interrupted gesture remains suspended, due to divine intervention. The painting represents a more mature stage in the artistic path of the author. In the rooms following this one, the works of some painters, defined caravaggesques, are displayed. Visitors have therefore the opportunity to observe the interpretation that other great artists, such as Artemisia Gentileschi, Bartolomeo Manfredi and Gherardo delle Notti, gave Caravaggio\'s legacy.